Welcome to the El Paso County Community Development Block Grant (CDBG) main page. Our program’s vision is to develop viable communities by ensuring a range of affordable housing choices, supporting necessary services and public infrastructure, strengthening the local economy, and mobilizing community resources to enhance collaboration and community partnerships. View the tabs below to learn more about our program and the funding cycle. CDAB meetings are currently held in the Economic Development Conference Room located at 9 E. Vermijo Avenue in Colorado Springs, Colorado. The next CDAB meeting is tentatively scheduled for Wednesday, April 17 at 12:30 p.m.
Public notices will be posted at least 24 hours in advance at the El Paso County Centennial Hall Building, located at 200 S. Cascade Avenue in Colorado Springs, Colorado. A fair housing event is tentatively scheduled for May 2019. Please check back in April for additional details regarding this event. El Paso County’s CDBG program year runs from April 1 – March 31. The 2019 application cycle closed on Friday, February 15, 2019. Please check back in December 2019 for information regarding the 2020 application cycle. The low to moderate income map link below is provided by the U.S. Department of Housing and Urban Development based on ACS data. For current recipients of funding and future recipient, this link is an excellent tool for scouting prospective locations for projects. CDBG funds can be awarded to local jurisdictions and non-profit organizations but not private individuals. Agencies with experience administering federal funding resources will likely have adequate internal controls and policies to successfully implement a CDBG funded project. The project must serve persons of low-to-moderate income who reside within El Paso County but outside the city limits of Colorado Springs. Eligible areas include Calhan, Fountain, Green Mountain Falls, Manitou Springs, Monument, Palmer Lake, Ramah, and unincorporated El Paso County. The project must meet one of the U.S. Department of Housing and Urban Development’s national objectives and one of the El Paso County Consolidated Plan goals. National objectives and local goals are described in detail under the Goals tab. Please contact our office directly to discuss the eligibility of a specific program or project. The U.S. Department of Housing and Urban Development has outlined three clear objectives to be fulfilled by the CDBG program. Every project funded by CDBG funds must accomplish one of the three following objectives: address an urgent need, mitigate slum/blight conditions, or benefit persons of low-to-moderate income. 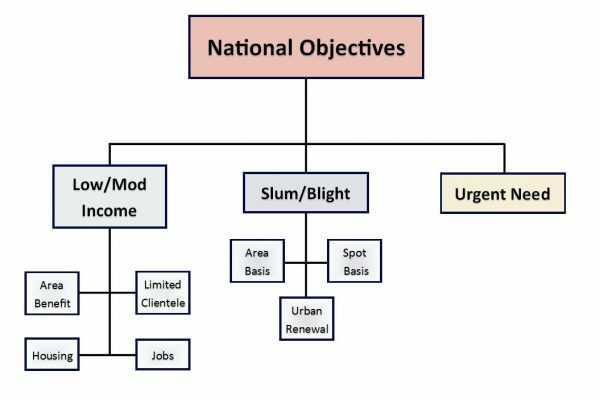 Additionally, mitigating slum/blight conditions or benefiting persons of low-to-moderate income can be accomplished through several different avenues. A visual breakdown of these objectives is presented below. In addition to meeting a national objective, all projects funded by the El Paso County CDBG Program must meet at least one of the goals outlined in our 2017-2021 Consolidated Plan. Please note all goals denoted with an ‘AFH’ in reference to our Assessment of Fair Housing are considered high priority goals. An in-depth listing of all goals is linked below. Before El Paso County CDBG Program projects may begin expending funds, they must first be approved by the Board of County Commissioners and the U.S. Department of Housing and Urban Development (HUD). Projects are selected and submitted for approval on an annual basis, with the final approval from HUD usually occurring in July or August each year. Click the links below to see current and past projects, as well as a few highlighted projects that have made an exceptional difference in our community. Whether you are a first-time recipient of El Paso County CDBG funding or a federal funding old timer, this page will help your agency keep your project in compliance with all associated requirements. All funding applicants are highly encouraged to review the documents below in advance of submitting their application. These links will help you prepare an application that addresses the needs of the CDBG program as well as develop a deeper understanding of what to expect when developing a potential project. Not sure which reports to submit, or when they’re due? Start off by reviewing the 2018 CDBG Reporting Schedule below. Additional questions can be directed to CDBG staff using the contact information at the bottom of the page. In order to receive CDBG entitlement funds from the U.S. Department of Housing and Urban Development, El Paso County CDBG staff must prepare a series of annual and five-year reports for the federal agency’s review. All applicable reports for the current program year and consolidated plan cycle are posted here as they become available. The El Paso County CDBG Program is committed to affirmatively furthering fair housing within our jurisdiction as delineated in our 2017-2021 Consolidated Plan goal AFH4. Our program hosts two free and open to the public fair housing events each year, which are posted under the Events and Notices tab as they are scheduled. Below is a collection of free resources relevant to the Fair Housing Act, including agencies that can assist individuals in filing fair housing complaints. The Community Development Advisory Board (CDAB) reviews matters of importance regarding the CDBG program and makes recommendations to the El Paso County Board of Commissioners concerning community development issues and use of CDBG funds. The CDAB is comprised of 12 voting members, including a representative from each of the municipalities participating in the El Paso County Community Development Block Grant Program and a representative from each of the commissioner districts. Participating municipalities advise the Board of County Commissioners who they have designated as their representative. Commissioner district representatives are appointed by the Board of County Commissioners. Members are appointed for five-year terms, with terms initially staggered, and are limited to serving two consecutive five-year terms. Please review the Events and Notices tab for upcoming CDAB meeting dates and times. Ready to learn more about CDBG? Contact us!